The other day I downloaded the second chapter of an ebook on bead embroidery, Altered Surfaces, by Cyndi Lavin. You can find it on her beading arts website, along with the first chapter which is a free download. I found the first book a comprehensive cover of all you need to know about bead embroidery. The second chapter is exciting in that you will find her suggestions for surface treatments of other fabrics, on which you can then bead embroider, nothing short of inspiring. 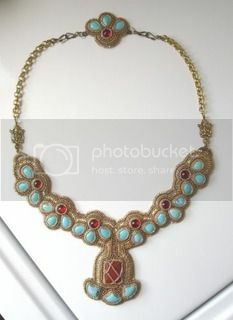 For an incredibly low $3(US) you can be inspired to create unique bead embroidery, too. I recommend this ebook, especially if you're looking for ways to make your work stand out from others, or simply as a way to help express your unique voice in your jewellery design. Here's a photo of some of my own bead embroidery, but I'm definitely looking at including some fabrics I've altered to my own designs soon.